Provide comfort for the family of John Wegener with a meaningful gesture of sympathy. 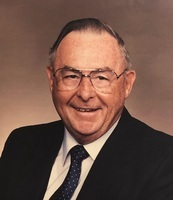 John J. Wegener, age 95, passed away on February 9, 2019 with his loving family by his side. John was born and raised in Philadelphia and has resided in South Jersey most of his life. He proudly served his county during World War II as a Navy Gunner. He was one of the founding members of the Occupational Training Center of Burlington County. He was a school bus driver for Moorestown Twp. In his free time, he loved to read and travel. He was predeceased by his wife, Elizabeth Wegener; his children, Caroline McAlister, David Wegener and Cynthia Morrone. John is survived by his daughters, Jacqueline L. Freeston (Robert) and Barbara Jones (Patrick). He is also survived by 12 grandchildren, 19 great grandchildren and 1 great great granddaughter. In lieu of flowers, donations in his name may be made to the Occupational Training Center of Burlington County, 2 Manhattan Drive Burlington, NJ 08016.